My houses were stamped in the challenge colors, using the Hearts Come Home stamp set, then fussy cut and set upon some stitched hills (Lawn Fawn). I added some Pool Party trees, a little snowman from the retired Jingle All the Way set, and finished it off with a sentiment and, of course, Santa streaking across the sky! I added a Pool Party bow at the top to tie it all together! I hope that you'll play with our color challenge this week...it's a delightful one, especially in non-traditional holiday hues! Be sure to check out the DT samples as well! Thanks for popping in and be blessed today! 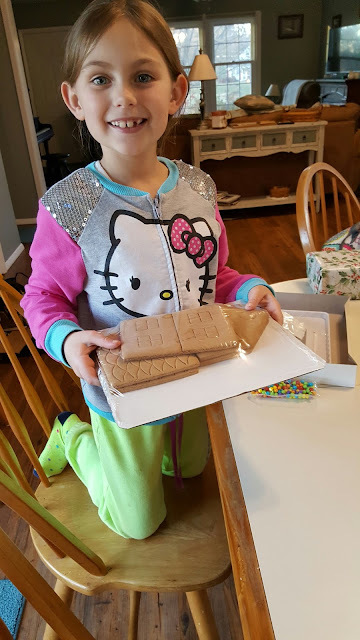 I have always wanted to make a gingerbread house with Cassidy, but the kits seemed like cheating...however, with the limited time I have with her now, when she saw a Minion kit in the grocery store, I caved! I have to admit, it was fun, although I did transfer the icing to one of my piping bags to make it easier! I'll share the finished house in my next post---stay tuned! What a gorgeous gift bag, and perfect little Christmas scene, LeAnne! Ahhh gingerbread houses... I just end up eating all the embellishments... but I'd love to see this little house when complete! That gift bag is adorable! Such a sweet scene! And you don't want to know what gingerbread houses look like around here.....lol....my daughter just lets Emma have at it! Love the gift bag! 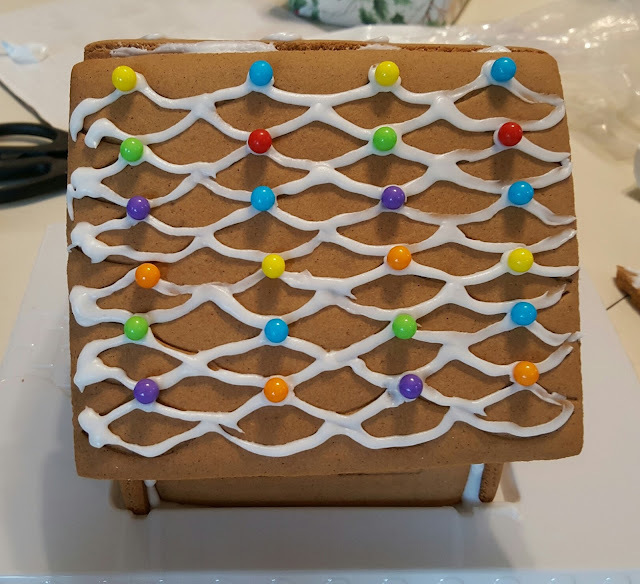 Just perfect and talk about perfect - the gingerbread roof is amazing! Very nice little ladies! Looking forward to the finished project! Merry Christmas to the Pugliese household! Are you enjoying your new kitchen LeAnne? I think that sinus thing traveled your way from my way!! Hope you feel better soon. Your goodie bag is so cute! I love the sweet winter village you created and of course the polka dot sky. 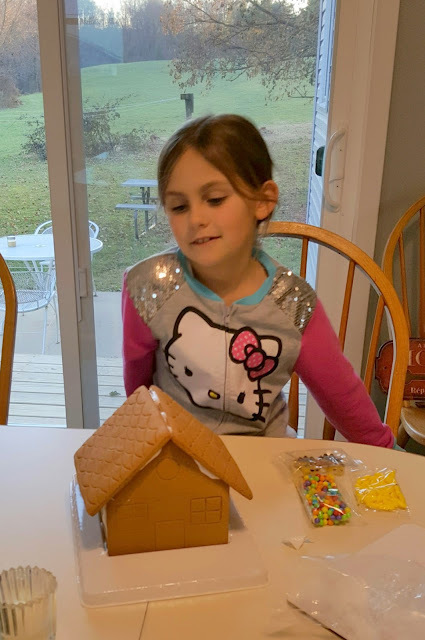 Can't wait to see the finished gingerbread house!